Next Generation - Medicine. Free US delivery. Medicine is a fast growing and strong F1 hybrid. The Sativa dominant growth structure makes it quick to stretch. It has strong aroma and deep flavour. Great choice for medical growers, very potent and heady, most bang for your buck. Very versatile, works great in soil or hydro, buckets or tables. 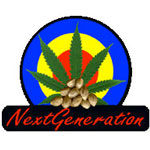 The Sweet Skunk used in this cross is the original mother of Next Generation's BC Harvest cup` winning Island Sweet Skunk.